I posted photos of White-throated Honeyeaters on December 8. 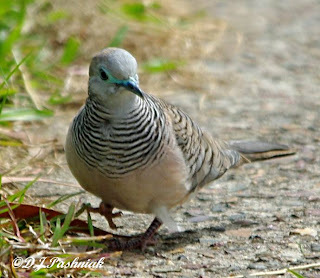 In between all the rain we have been having they have been back to my garden several times. When I photographed them again I realized there were several juveniles. Instead of a black cap the juveniles have brown caps which change gradually into the black of the adults. The next day they were back and several with the usual black caps sat up in the trees and preened while I came close and took their photos. An update on the weather! We have had some really spectacular thunderstorms nearly every night and although I turn off the computer and unplug everything before the storms get close I got caught with a brief power failure when the storm was still a long way off. It messed up my modem and I have been off-line for a couple of days! 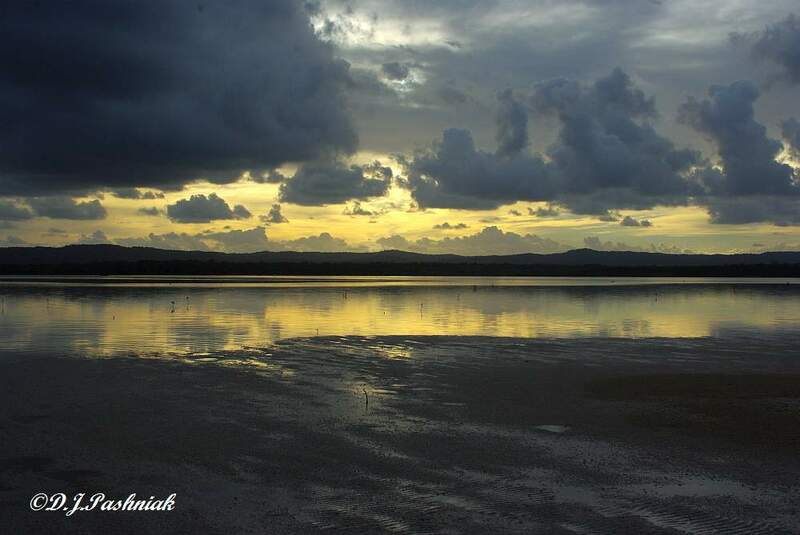 Long-time Queensland residents tell me this is a real old-time "wet season"! There was another 85mm of rain yesterday (nearly 3 1/2 inches on the old scale) and part of the road in to Gympie was closed because of a creek that had flooded. 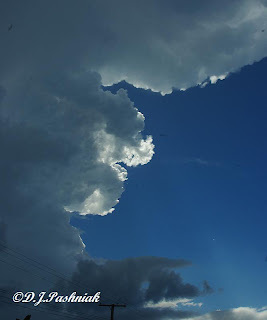 Two nights ago this big storm cloud came up from the south and looked as if it could bring some pretty serious rain. However, it blew out to nothing and all we got were a few spits of rain. 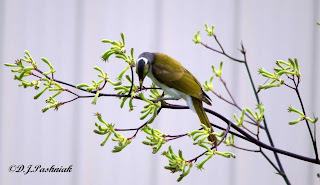 I was out in my back-yard the other afternoon when I noticed a bird in my grevillea trees that looked rather smaller than the Rainbow Lorikeets that are usually there. I went inside for my camera and came out again as quickly as I could and the birds were still there. 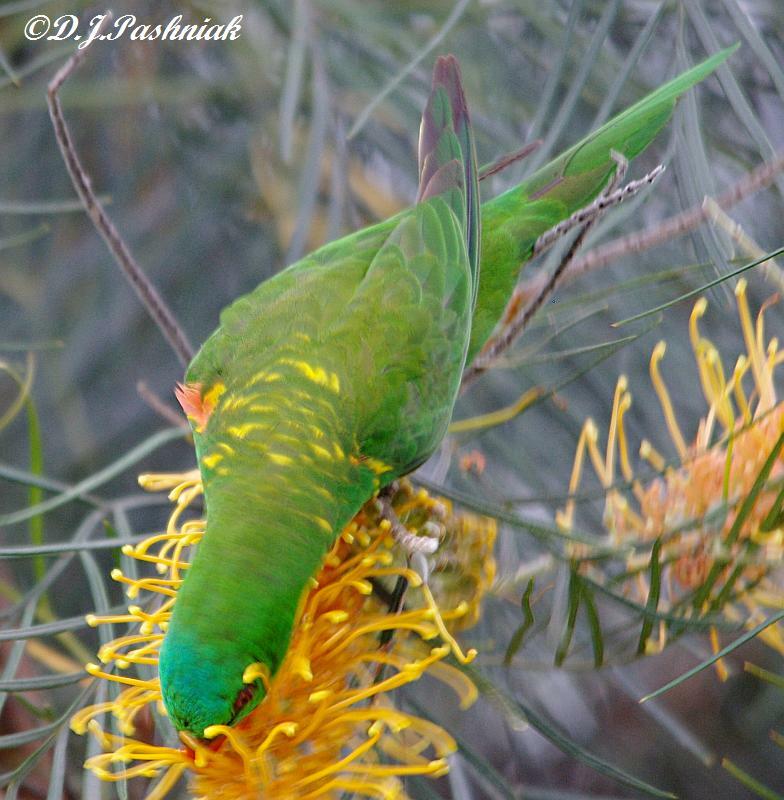 However, before I could get anything other than distant photos the Rainbow Lorikeets dropped in (literally!) - screaming. It was obvious that they didn't want any other bird in the tree while they were there and the smaller ones took off in a hurry. Half an hour later the Rainbow Lorikeets were gone and the others returned. This time I was able to get close enough for photos and I saw that the new birds were Scaly-breasted Lorikeets (Trichoglossus chlorolepidotus). 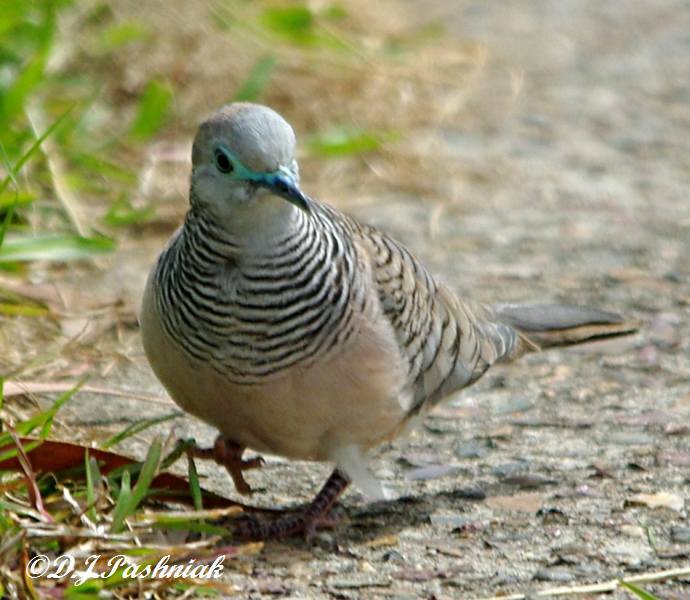 This was the first time I have seen these birds in my back-yard. 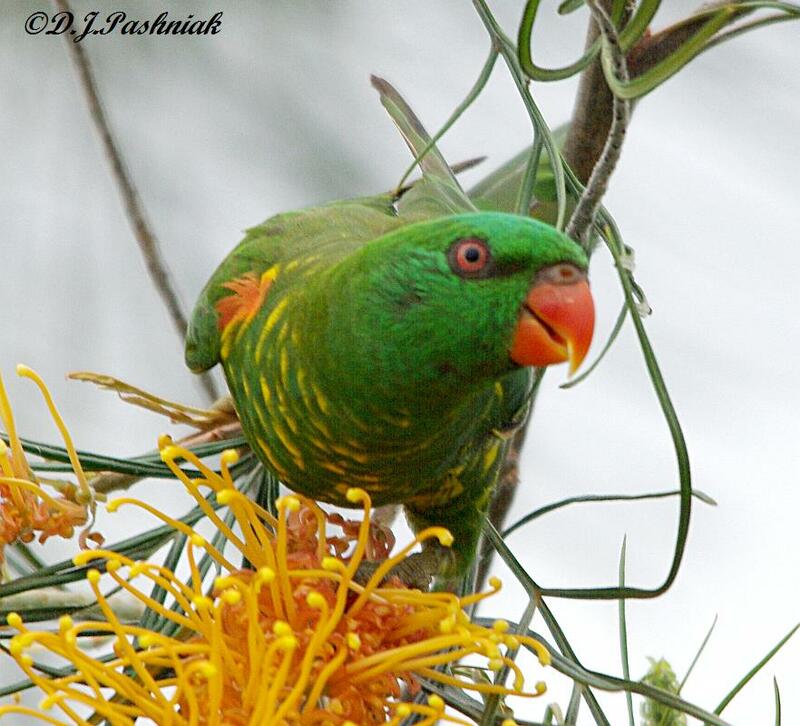 Once again the Rainbow Lorikeets arrived in a hurry and chased the smaller birds away again. It was a bit too dark for good photos. 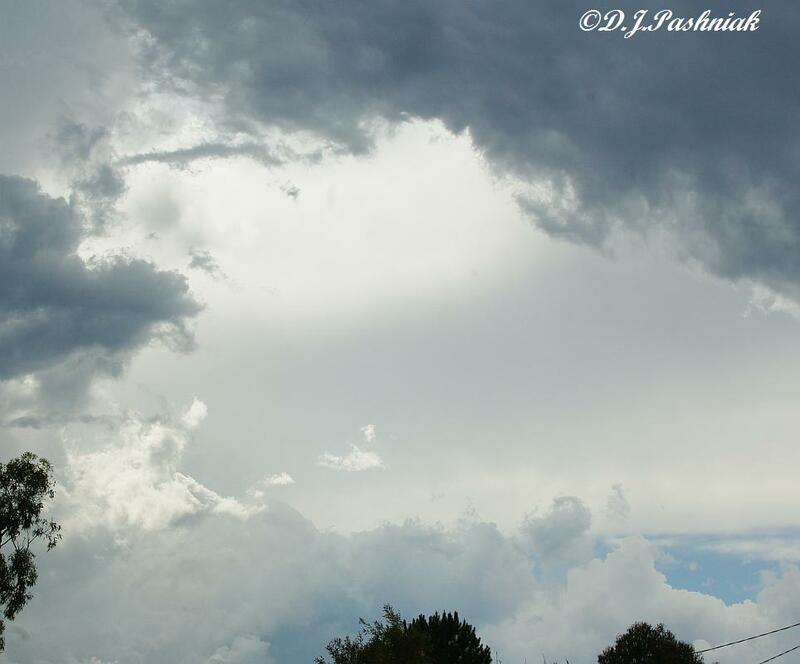 There were storms coming in and it started to rain soon after. The worst of the rain came the next day - 120mm in less than 10 hours! 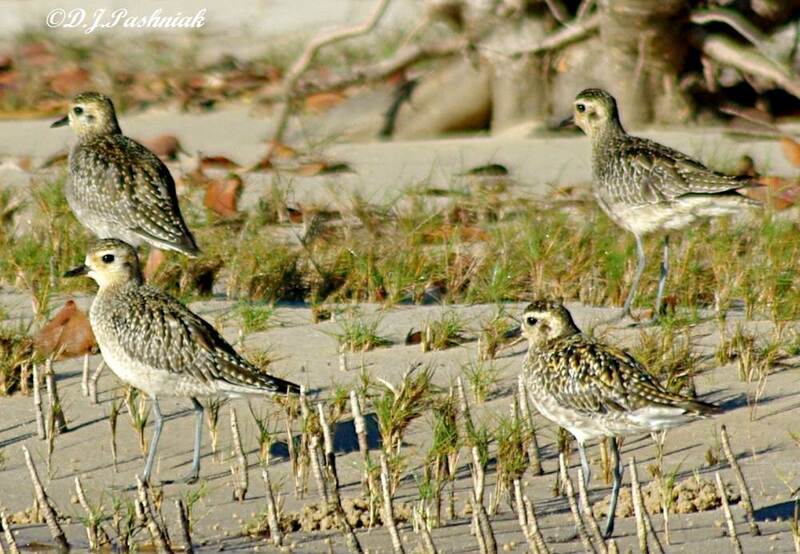 Inskip Point can be a very good place to see shorebirds. When the tide is very high the sand island out in the Strait where they usually roost is not big enough for them all to find a place to roost so they often use the Point itself. 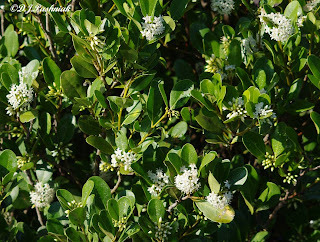 However, there is a lot of human disturbance there so the only way you can be sure of finding them is to choose a high tide early in the morning before there are too many people around. The Terns were standing on the lip of sand just before it dropped down to the water. Then I noticed that in behind them and closer to the water were a number of shorebirds. Every time the waves broke they had to move a little. These are Crested Terns in full breeding plumage in the foreground of this photo with a shadowy line of shorebirds behind them. All the birds moved again and I was able to get photos of the shorebirds without the Terns standing in front. There were numbers of Bar-tailed Godwits and also Great Knots and Curlew Sandpipers. The Bar-tailed Godwits are the largest birds with slightly up-turned beaks. The Great Knots are smaller with straight beaks and the Curlew Sandpipers are a little smaller again with slightly down-turned beaks. The birds all started to move again and when I looked around there was a man walking along the edge of the water. 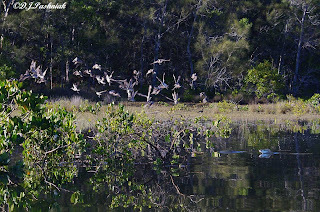 The birds all flew up and some of them flew to the other side of the Point and roosted there at the edge of the water. The man walking continued around the Point and then started back along the other side where the birds were now roosting. 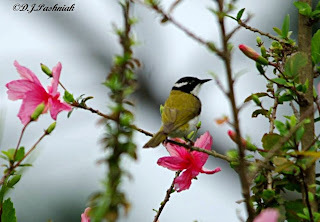 This time when they flew they left! Some went out to the sand island and some went over the channel towards Fraser Island. It's not easy for shorebirds when there are tourists and fishermen all around! 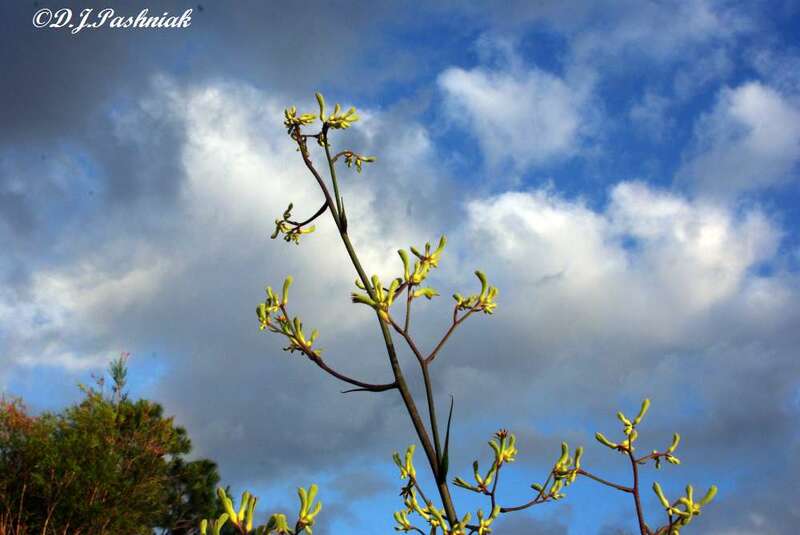 For more photos of the sky visit Skywatch Friday. 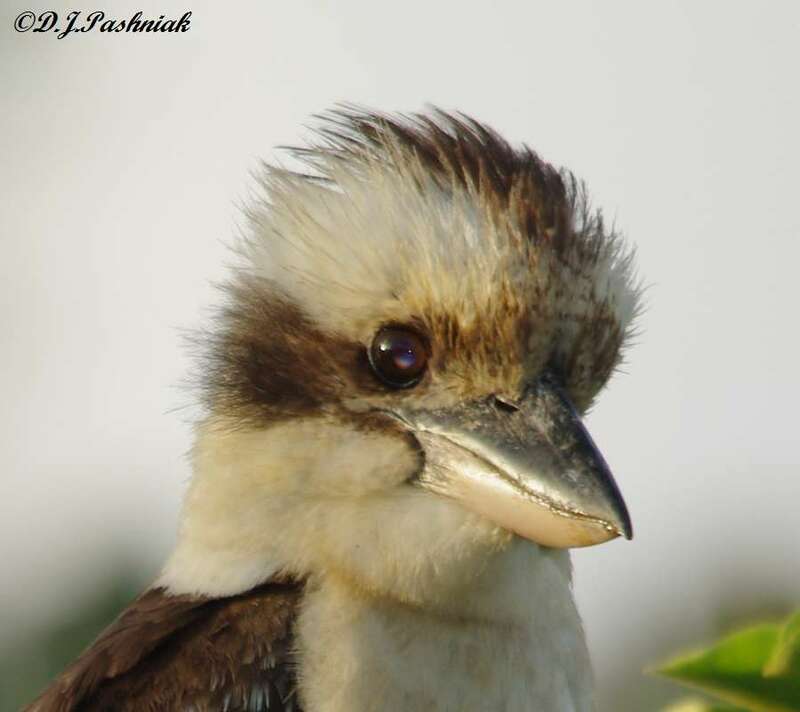 This is my first post for World Bird Wednesday. Go there to see a great variety of birds. 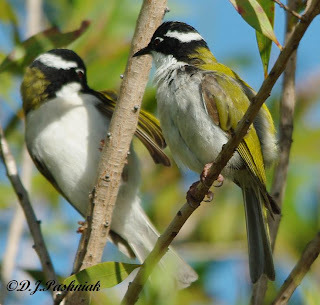 A few months ago White-throated Honeyeaters (Melithreptus albogularis) were frequent visitors to my garden but then they went away. 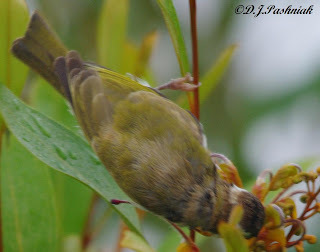 Over the last few weeks I have seen them again but only when it was wet and windy. On good days when the photos would have been so much better they were nowhere to be seen! 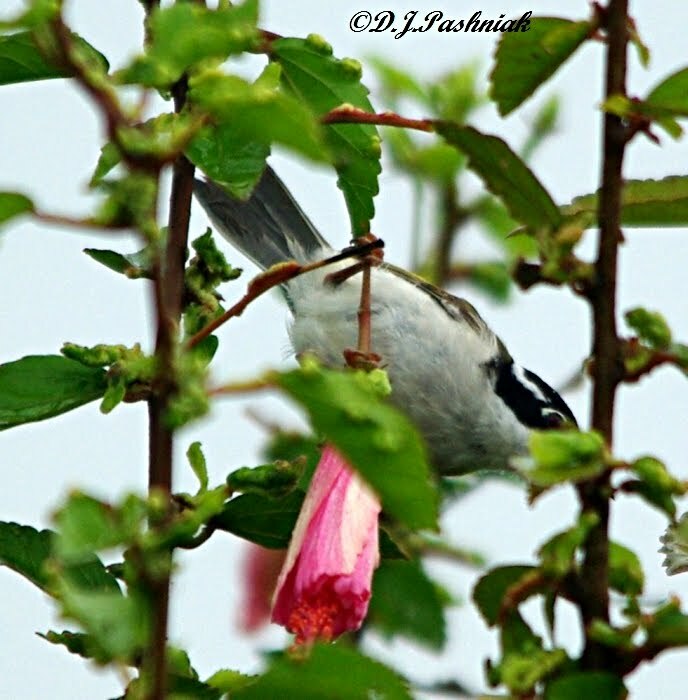 They seem to like the Hibiscus flowers or to hide up in the Callistemons. Once again the tides are great for kayaking and seeing the shorebirds and the weather is terrible! We've had 50mm (2 inches) of rain in the last 36 hours. This is certainly not as much as some areas are getting but I won't take my camera out in it. Last Thursday I dodged the showers and walked out to Mullens. It rained just before I got down there and then rained again just after I reached the car to drive home. In between I saw some interesting birds. The bigger shorebirds were on the far side of the bay and inaccessible for photos. However, as I walked out onto the saltmarsh flats I saw some small birds and a few terns on my side of the bay. Gull-billed Terns (Sterna nilotica) nest inland where it is wet but spend the rest of the time out here on the coast. 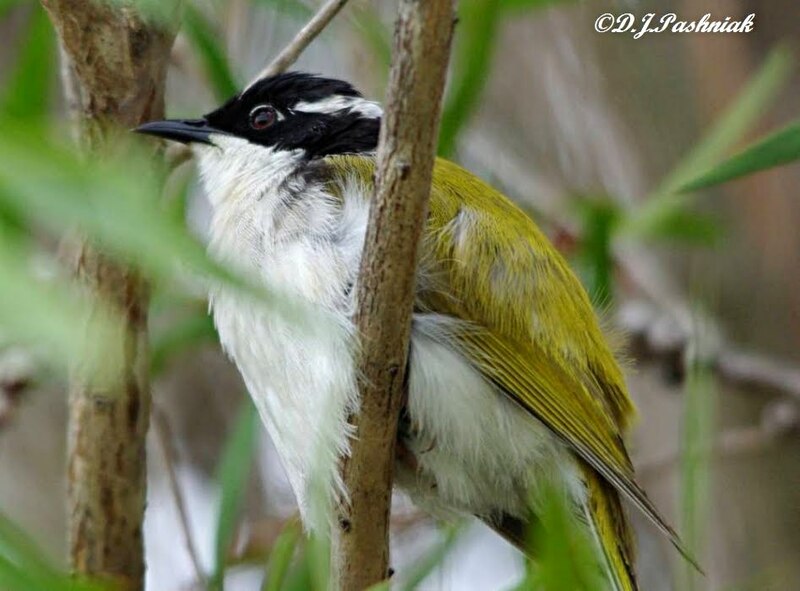 Birds in breeding plumage have a full dark cap and those in non-breeding plumage have only a black patch around the eye. Both of these birds in non-breeding plumage still show some dark pin-feathers on their heads. 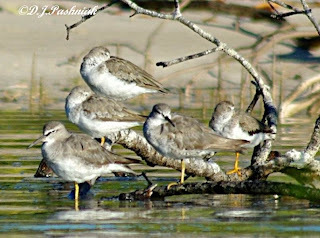 There was a large flock of Lesser Sand-Plovers (Charadrius mongolus) roosting with the Terns at the edge of the water. 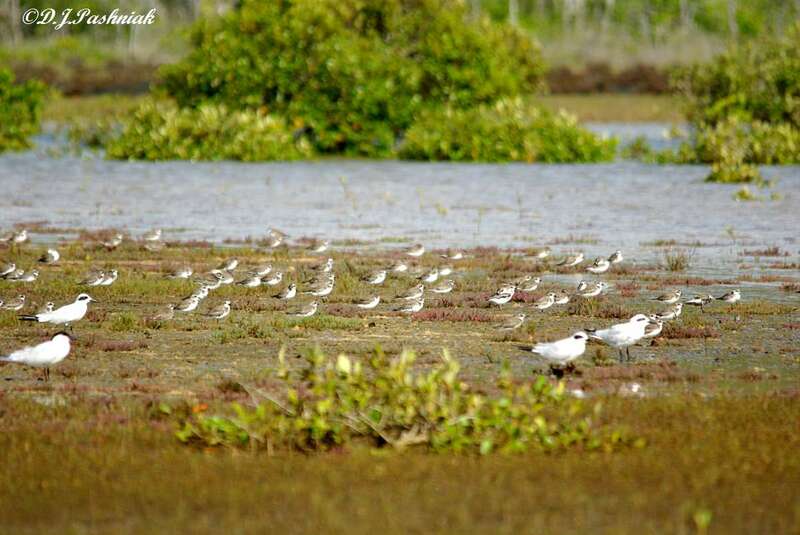 Further around the bay were flocks of mixed Red-capped Plovers and Red-necked Stints. 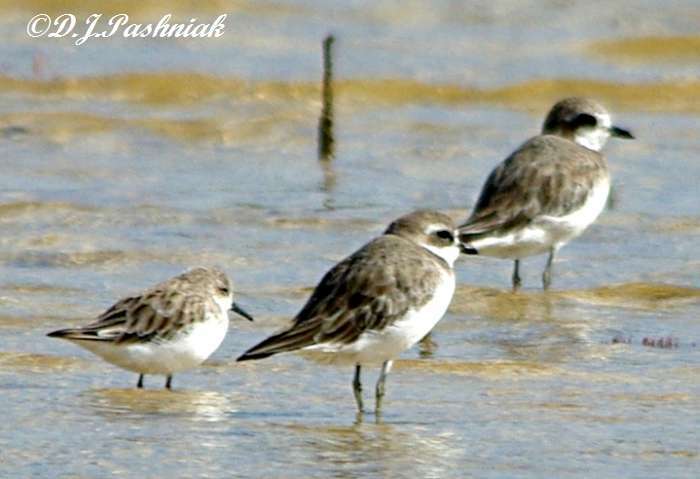 I photographed one Red-necked Stint (Caladris ruficollis) standing with the Lesser Sand-Plovers. The Stint looked very small standing next to the Plovers. I also photographed one Little Tern (Sterna albifrons) standing with the Lesser Sand-Plovers. 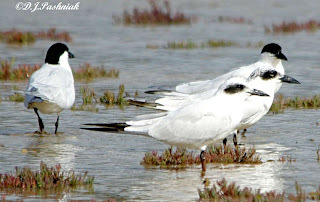 This is one of the migratory terns which come down here from Asia during our summer. Yesterday I went for an early morning walk along the foreshore at Mullens. Although it was well after sunrise there wasn't much light coming through the very heavy cloud cover. Although I could see the shorebirds across the other side of the roost they were too far away for photos. The only shorebird I got close to was this Eastern Curlew which was roosting out on the little rocky point. 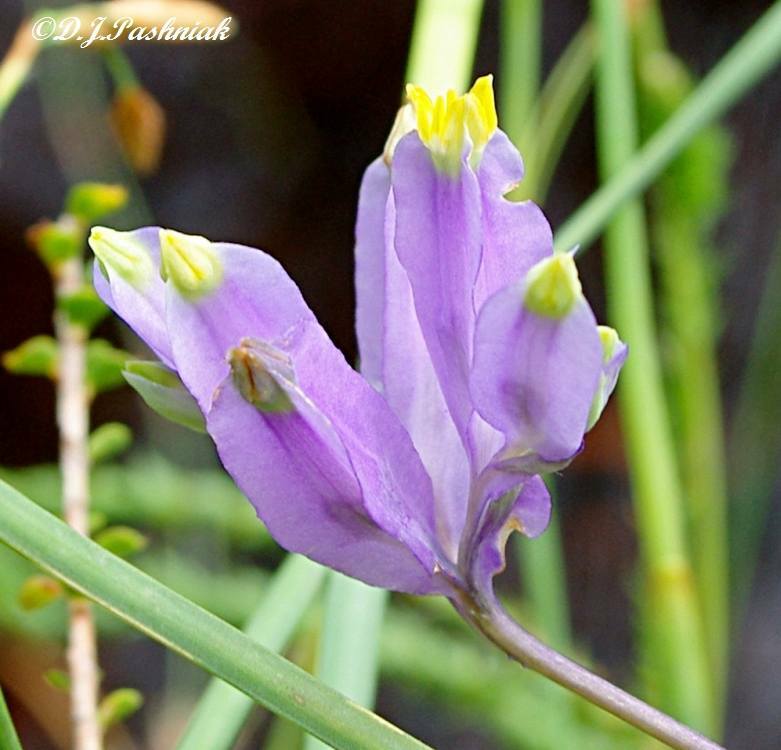 The really interesting sight of the morning was the number of saltmarsh plants which were in full flower. There are only half a dozen different plants across the whole of the saltmarsh flats but some of them are so similar that it is not easy to ID them. I know that this is one of the Tecticornias - common name Glasswort. 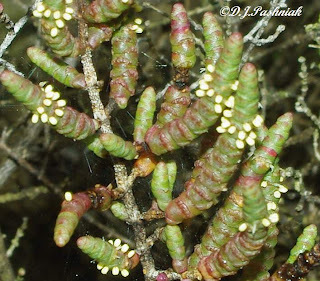 (This species used to be called Halosarcia but has recently be renamed.) There are three kinds of Tecticornias and I still cannot ID the two that we have growing out on these flats. The one in flower right now is a little low growing shrub not more than 300-400mm high. 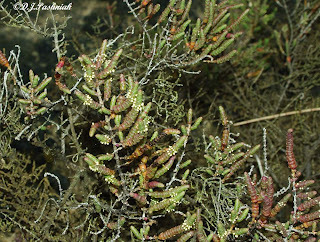 It stands out from the other plants which grow low and spread out on the sand. I have just had this plant ID'd for me as Tecticornia inidica. Thanks Moyra! I am intrigued that so many of these plants are flowering when they look so dried and burnt. Those little white dots may not look like flowers but they certainly attract the bees and other insects. A couple of weeks ago while out at Inskip Point I took some photos of a group of Ruddy Turnstones (Arenaria interpres), Sanderlings (Calidris alba), and a Red-necked Stint (Calidris ruficollis). I have only seen Ruddy Turnstones and Sanderlings at Inskip - not further south on the bay. A group of 5 of both were walking along the edge of the water out on the far side of the sand island at low tide. The photos that I took give a good opportunity to compare the sizes of all 3 species of bird. 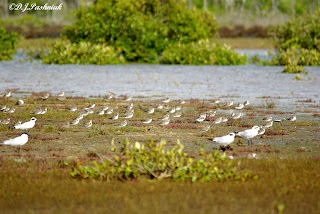 In the first photo the Ruddy Turnstones are the darker colored birds at the rear of the photo and the Red-necked Stint is right in the foreground - and unfortunately a little out of focus. It is also interesting to see a range of plumage on the birds as they had recently returned from their breeding areas up north and were still changing into non-breeding plumage. 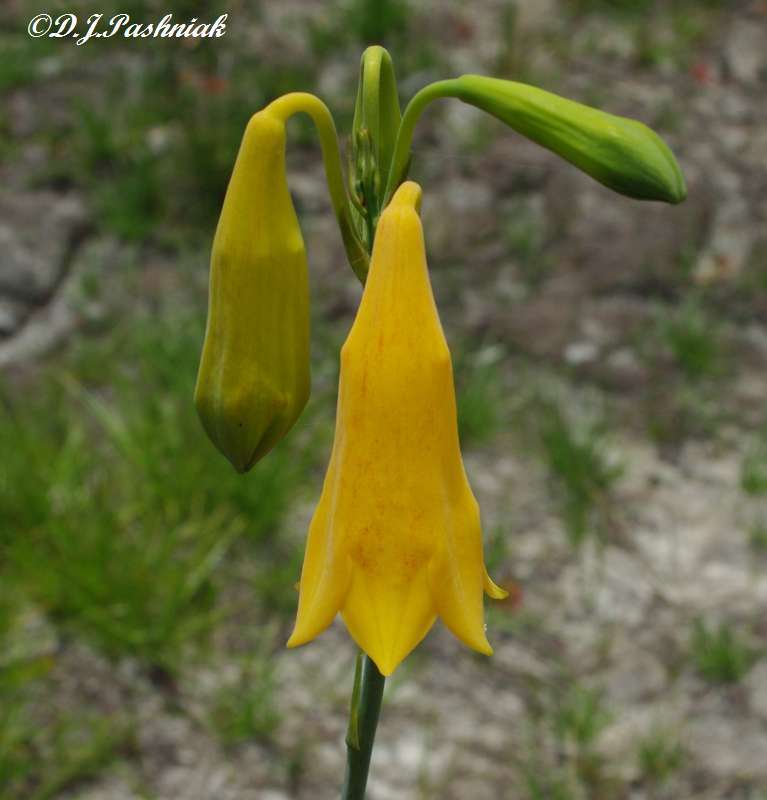 All photos enlarge when clicked on and I have left the photos quite large. No Red-necked Stint in this photo. 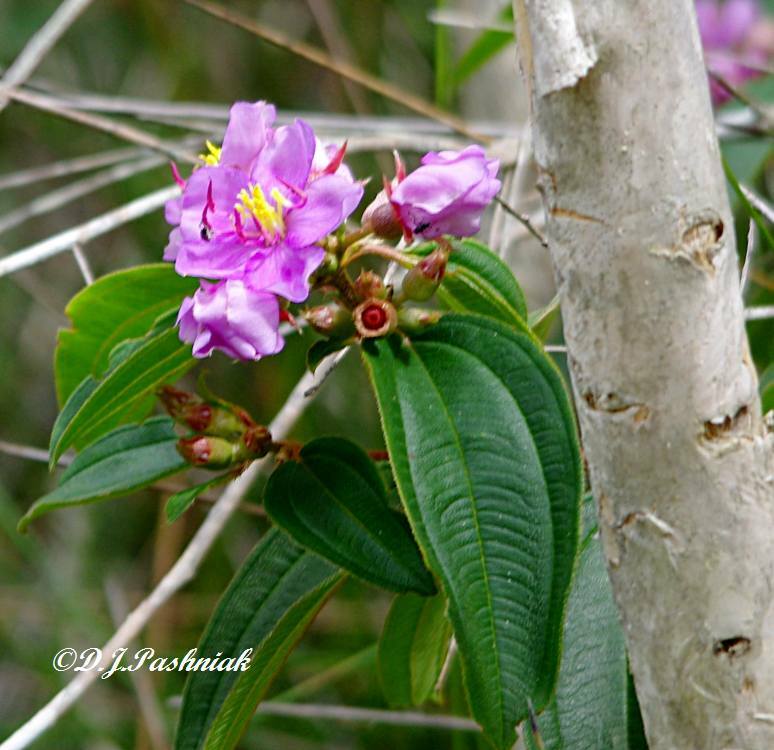 Yesterday, I went for a walk along the path beside Schnapper Creek that is often called the flower walk. Everything down there was very wet but also very green with all the recent rain. The most beautiful flowers that we found were these little Christmas Candles (Burmannia disticha) which were growing right where I had found some a couple of years ago. 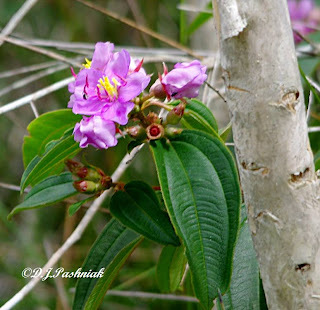 I also saw a number of Native Lasiandra shrubs (Melastoma malabathricum) which were making a beautiful splash of color among the Paperbark trees. There were birds everywhere - but unfortunately most of them did not have time to sit and have their photos taken. 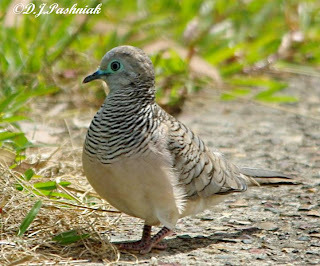 The only ones that came close were a couple of Peaceful Doves (Geopelia striata) that were walking along the path towards me and were very busy picking at seeds from the side of the path. 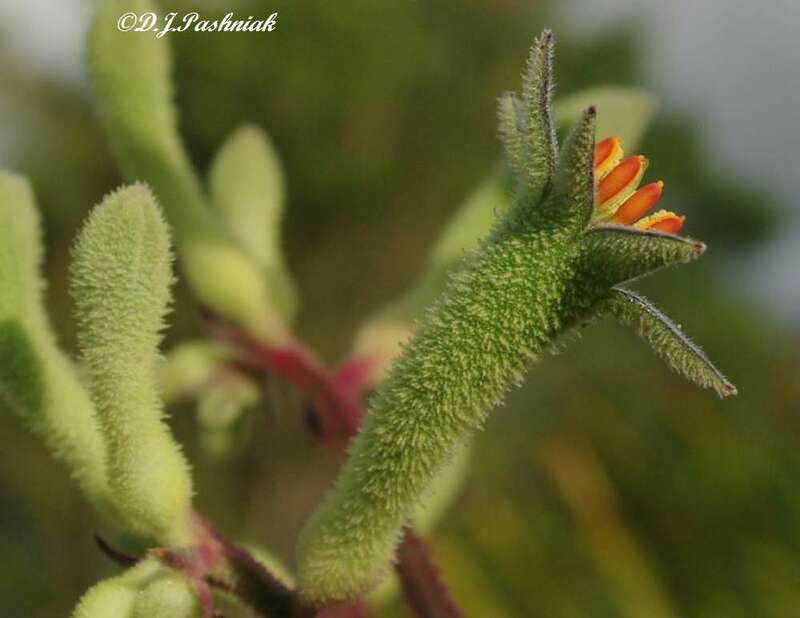 Kangaroo Paw is the name given to a flower that comes from south western Australia. Kangaroo Paws are from the genus anigozanthos. They have become very popular as a garden flower. 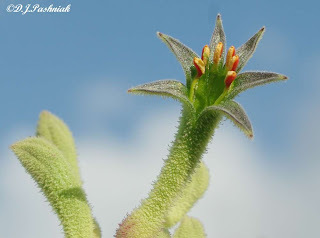 The ones in my garden are very tall with the flower stalk being well over 2 meters. The flowers are a green color, although other colors are also common. 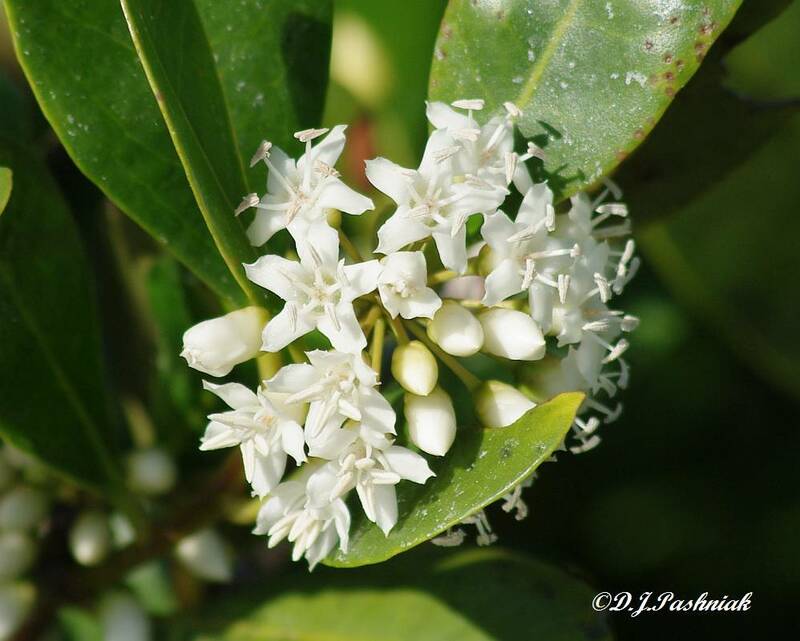 These flowers are not nearly so bright or spectacular as others in the garden but the birds love them. 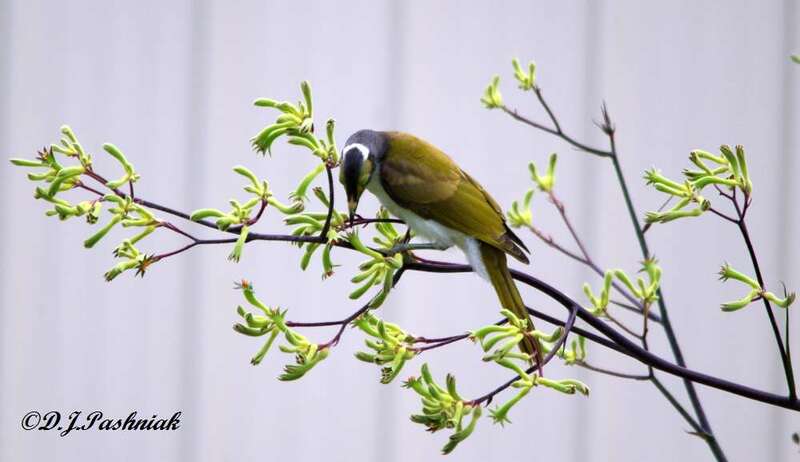 Honeyeaters - especially Blue-faced Honeyeaters and Noisy Friarbirds - come and grab at the flower stalks and then swing them over and walk over the stalks to get to the flowers. Once again there are good high tides early in the morning which should be great for kayaking. However, once again we are having some very bad weather - high winds and quite a lot of rain. 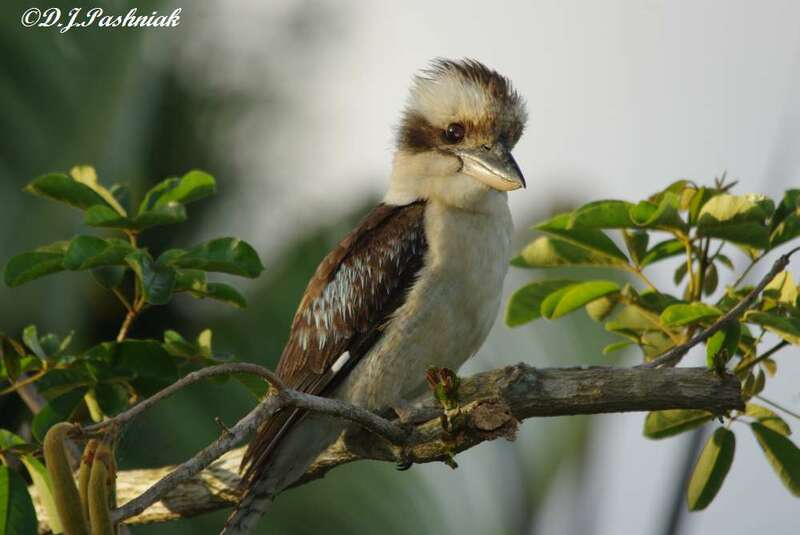 So the best I can do is post photos of a Kookaburra that sat on a low branch in my backyard. I walked quite close without it moving at all - it just watched me with a very bright eye! 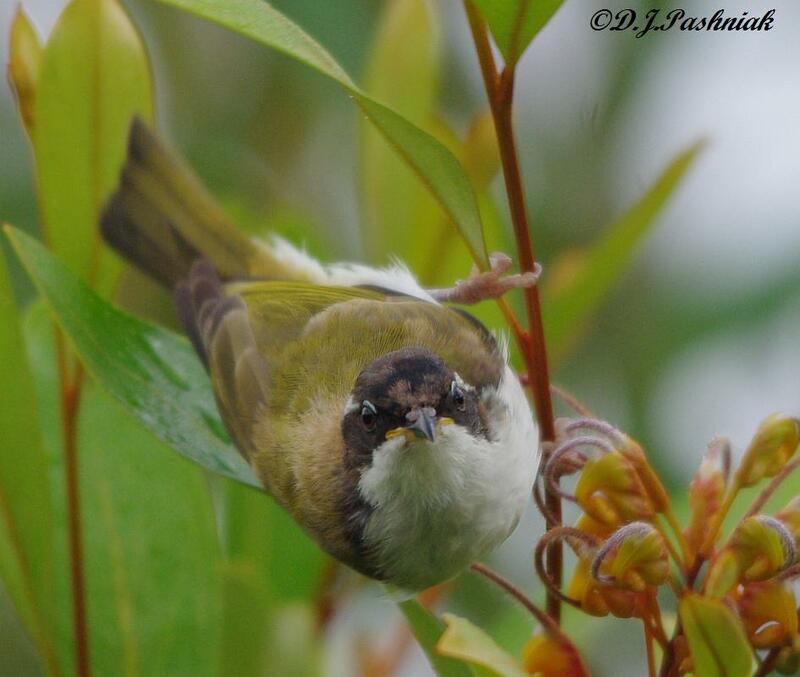 The second photo is a crop to show that bright eye! 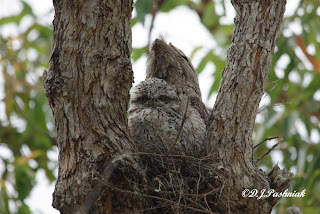 I first posted photos of the Tawny Frogmouths in the nest on October 27. I posted a second photo of them on November 9. They have certainly grown bigger since then! When I looked up at the nest this time one of the juveniles was sitting up in front of the adult. 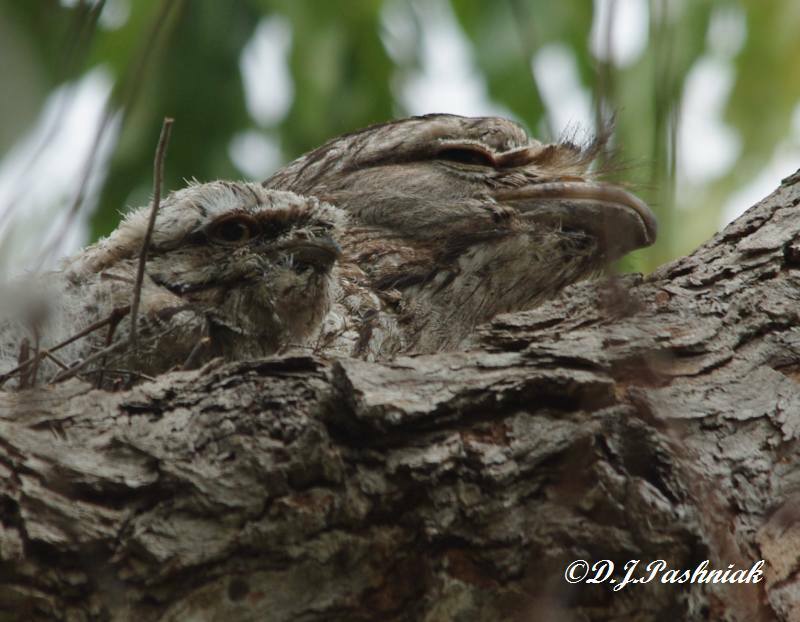 I went to the other side of the nest and there was another juvenile lying down along a branch by the adult. 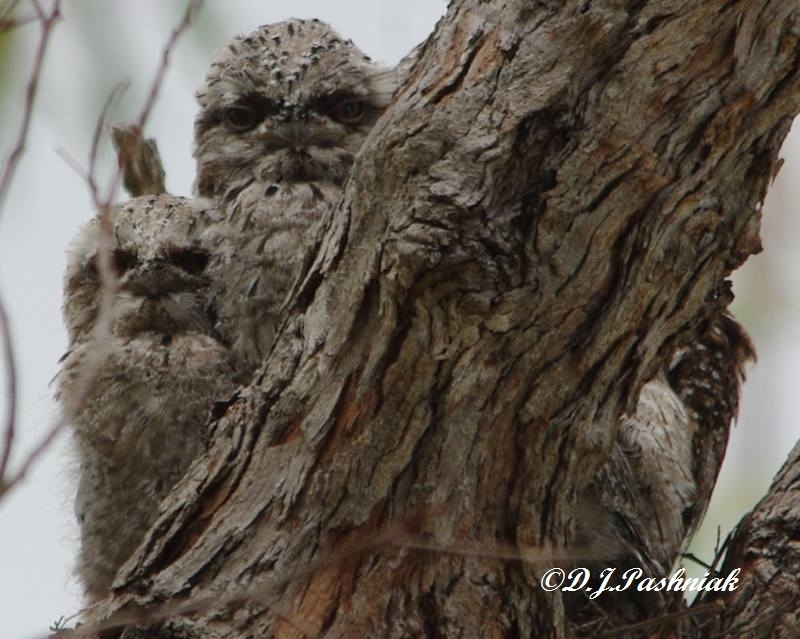 However, when I went to get in the car and leave there were two little heads peering at me over the branch. I don't know if baby number one had joined baby number two or if there are maybe three up there. They looked just as curious about me as I was about them. 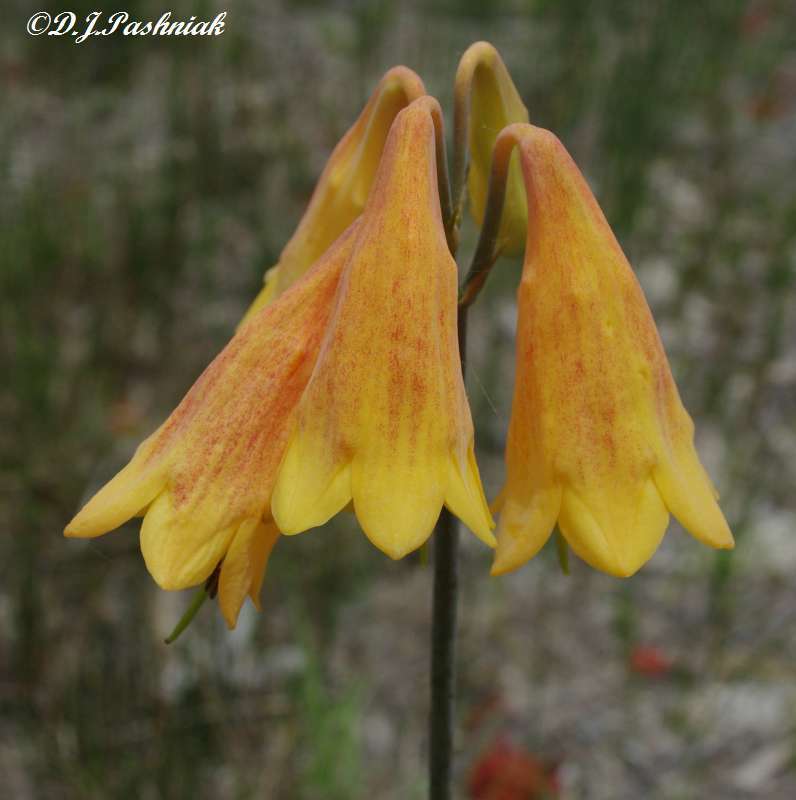 Christmas Bells (Blandfordia grandiflora) are a common sight in the Wallum area around here. They have been flowering for several weeks now and every time I saw them as I drove along I thought that I should stop and get photos - and didn't! 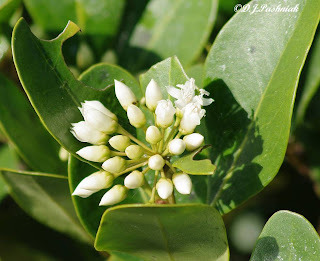 Then my neighbor told me that they were flowering just behind her house. 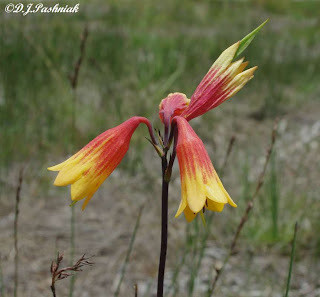 There is a wide strip of land there that has been cleared and burnt and then bulldozed over to make a fire break and these flowers had come up in that ground. The red and yellow form is the most common but there were straight yellow ones and then ones that were mainly yellow but with a wash of orange/red. I don't know if there will be any left until Christmas time - maybe in areas where it is damper and not so sunny. All the shorebird roosts that we monitor and count present challenges but one of the most challenging is the one we call the Airport Roost. It is a sandbank with mangroves growing on both sides of it. I have kayaked in to the side closest to the land but I have never managed to get out there without disturbing some of the birds into flying off. On the other side you must sit in the kayak and count from there. You can come in close enough to see the birds fairly clearly. 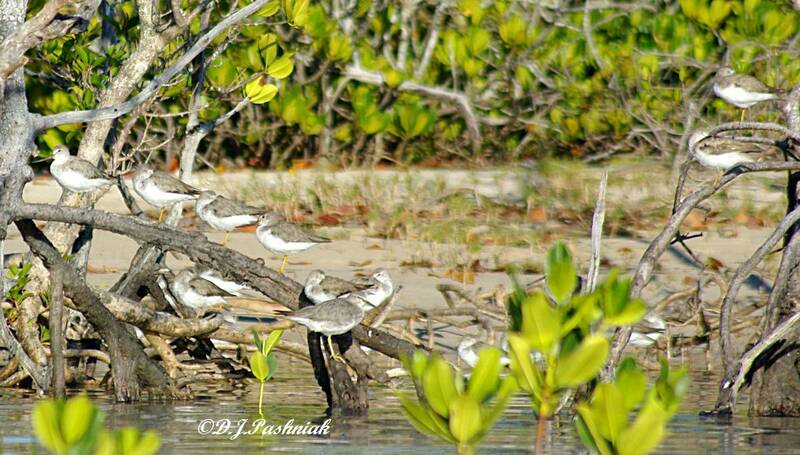 However, Terek Sandpipers and Grey-tailed Tattlers use this roost. 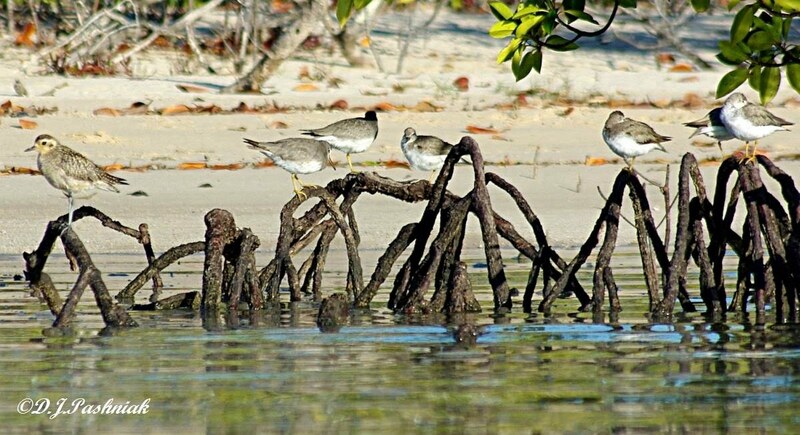 They roost on the sand, on exposed mangrove roots and in the open branches depending on the tide height. 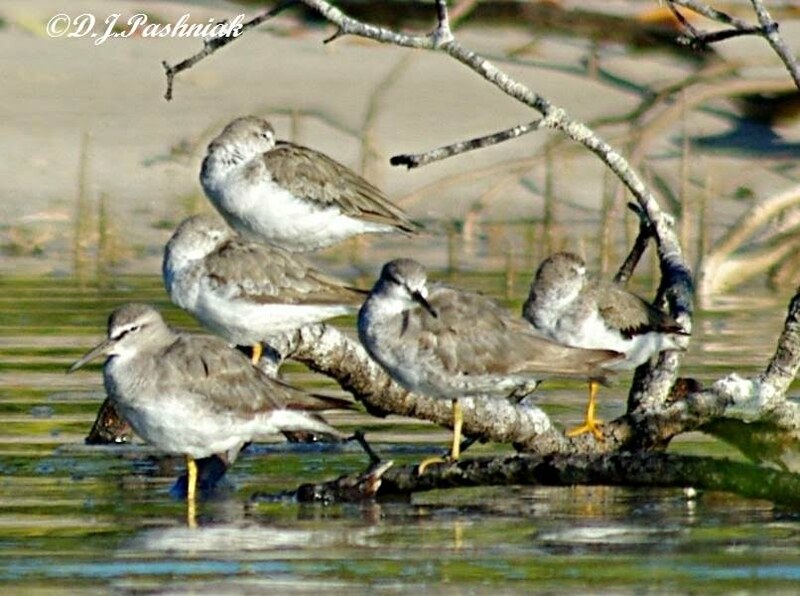 Terek Sandpipers and Grey-tailed Tattlers are easy to distinguish if they have their heads up - the Terek Sandpiper has a bill that turns up slightly and the Grey-tailed Tattler has a straight bill. There is a also a difference in the color around the eye. When they are roosting with their heads tucked under their wings it is much more difficult. 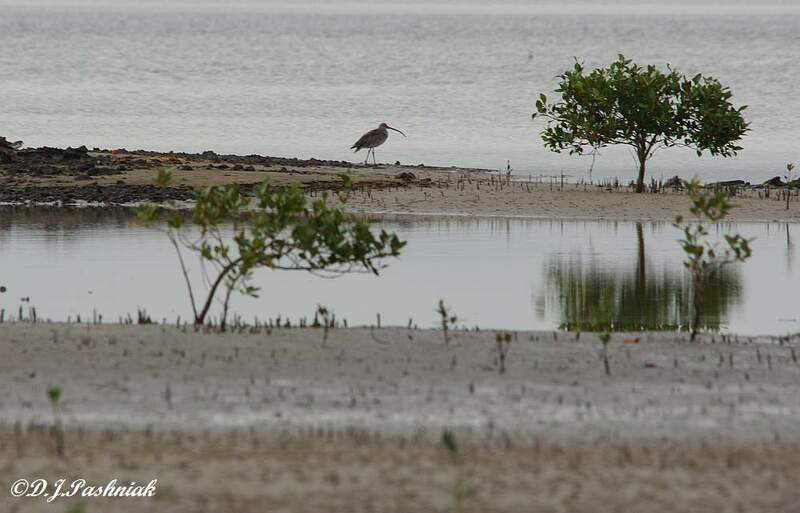 The Terek Sandpiper has darker orange colored legs, but this is hard to see at a distance with only binoculars. 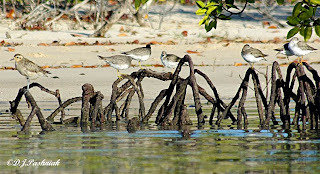 In this photo two Grey-tailed Tattlers have their heads up. There is a Terek Sandpiper on the right of the photo - and the others I am not sure of! Now, spot the different bird in this photo! There is a Pacific Golden Plover on the left of the photo. This is the only time I have seen a Pacific Golden Plover roosting in a tree. There were other Pacific Golden Plovers there as well but they were all on the sand. The other morning I kayaked up Mullens Creek a little way. 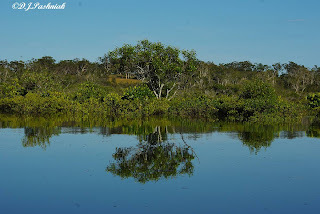 The water was very still and the reflections were beautiful. As I came around a bend in the creek a number of shorebirds flew up from the side of the creek. They don't usually use this spot as a roost and I had unfortunately disturbed them. 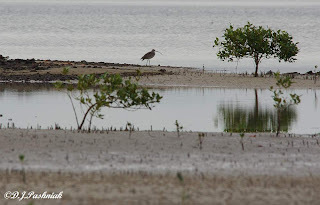 Most of them appeared to be Whimbrels and they flew off across the creek to another roost site where they usually roost in the mangroves. I heard the splash of a fish jumping as I was photographing the birds flying off and when I looked at the photos at home I had managed to catch the fish jumping.